The rough terrains and picture perfect mountains behold the mystery of this place. The magnificent stupas and gompas sing an untold history of Buddha. Nature unfolds to you in the most glorious forms here. 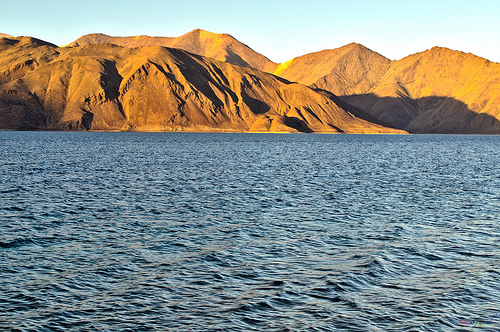 This is Ladakh- a place of unforgettable scenery that will definitely make you fall in love with this place. The snowcapped hills of Ladakh have enchanted travelers and tourists since decades. The culture, traditions and natural beauty has always attracted people from all over the world. The azure blue water and the rustic view of the Changtang plateau will leave you spellbound. Located at a magnificent height of 4,250 meters, this lake is the largest brackish lake in Asia. An interplay of the sunrays and the lake water create beautiful light effects which will remain etched in your memory forever. If you come during the winter season, you will find the lake frozen. You can ice skate on the frozen surface. This place is known to be the highest motorable pass in the world. A motorbike ride over the rough terrains will surely add a zing of adventure to you visit. 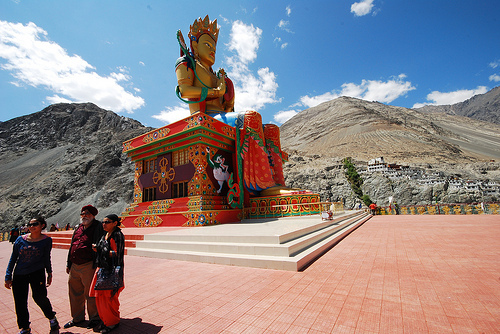 The place offers you an exciting view of Leh and the mountain ranges. You will be spoiled of choices as there are so many beautiful monasteries in Ladakh. Among all, Diskit monastery is the oldest and largest Buddhist monastery in Ladakh. In the prayer hall of the monastery, you will find the peaceful likeness of Maitreya Buddha. The monastery belongs to the Gelugpa sect or Yellow Hat sect of Tibetan Buddhism. This is one of the most extraordinary Buddhist monuments that you will come across. The white structure hemmed by the rocky mountains will give you a serene feeling. This stupa was built to celebrate 2500 years of Buddhism. Do you know that the relics of Buddha lies at its base? Visit this place and submerge into its beauty. White sand dunes and two humped camels will greet you when you visit this place. The picturesque view of this high altitude desert is going to take your breath away. Move north from here, you will get the Siachen valley and you will find Sasser pass in the northeast of this place. We hope that these suggestions help you. For a complete Ladakh travel guide, please visit our website.